In the first three quarters against Iowa, Michigan had 20 first downs. They ran the ball on 14 of them and gained only 50 yards for 3.57 YPC, mostly because Iowa broke tendency and played a single-high safety defensive front, stacked against the run. With someone like Chad Henne under center--a polished passer--an average of 2nd and 7 isn't as large of an issue, but Denard Robinson has shown time and again that he can't excel in long down and distance situations. On the season, he completed 62.5% of his passes for 8.8 yards per attempt. On obvious passing downs, he completed only 44% of his passes for 5.7 yards per attempt. In addition, Denard threw nearly half of his interceptions in these scenarios. While you might expect that (trying to force the ball to a receiver to pick up a first down), it implies that he's either not particularly careful with the ball in OPD (he had a 7.1% interception ratio) or he has difficulty reading defenses and executing the throws. Regardless, when Michigan earned a first down against Iowa in non-hurry-up mode, 75% of the time, the team would line up in a running formation, with Iowa's defense loading the box, and head directly into it. When the team was down 15 points in the fourth quarter, Al Borges decided to spread the field and air it out. 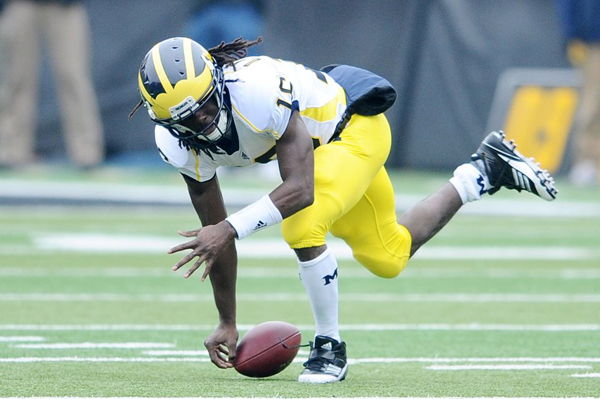 On their fourth-quarter scoring drive, Denard threw the ball on all four first downs. He connected for gains of 7, 9, 13, and 7, all four complete and one of them for a touchdown. On that drive, Michigan marched 57 yards in just under three minutes, had one incompletion, and didn't have a single negative play. Michigan is a better football team than Iowa, of this I cannot be convinced otherwise. This is a loss that can be chalked up to a coaching transition. The I formation, both the coaching staff's insistence on using it and the team's inability to consistently exceed from it, explicitly lost Michigan this game. It's a growing pain, though the last time this happened, we were losing to Toledo, so things could be worse. With the talent and performance of this Michigan unit to date, a loss like this shouldn't be too frustrating: they aren't good enough to challenge for a BCS bowl and in a non-Bizarro Big Ten, they wouldn't be anywhere near a Big Ten championship. But with everyone in the league intent on losing to vastly inferior teams, Michigan was solidly in the running for a birth in the Big Ten title game. This loss effectively takes them out of it. What this says about the coaching staff is disappointing in the short term but not wholly unexpected. Brady Hoke's "We will run power" is not a lie, as early returns indicated. Losses like this don't need to happen but they do when you're switching coaches. Hoke is building a program in his image and unfortunately, that image doesn't best utilize the skills of Michigan's current personnel. Rodriguez did the same thing when he arrived on campus and Michigan went 3-9. With a team that's still wildly outplaying expectations and a coaching staff that has proven to be a significant upgrade over the previous one, this loss is the equivalent of being told you have to eat three more bites of vegetables before desert: you really don't want to but the reward will be something sweet. Desmond Morgan is a freshman. Morgan was atrocious in this game (I expect MGoBlog's UFR to be ugly for him). The first two scoring drives were nearly single-handedly his fault. He lost contain on almost all runs and Iowa made it a point to attack Michigan's WLB all game. It was no surprise that the coach's pulled Mogan after Iowa's second drive, but I was surprised to see him back on the field in the second half. This is still a young team. Blake Countess is a freshman. And he's really good. Countess is the best cornerback Michigan has had since well before Rodriguez came to Ann Arbor. He's going to be a special player. Denard had another awful day. Most of Denard's issues, as mentioned above, came from throwing in a long down and distances. The other factor contributing to his struggles were the wide receivers once again completely unable to create separation. Opponents have seen the tape and taken note: if you're physical with Michigan's receivers, you'll stick to them like glue. Denard was, however, progressing through his reads better than he has all season, which is encouraging. The running backs struggled because Iowa, like Michigan State, loaded the box and dared Michigan to throw the ball. The lack of audibles at the line is increasingly frustrating. The goal line stand. Iowa called four straight house blitzes when Michigan had first down from the three yard line. My only real complaint with the playcalling was the timeout before that series. When Michigan had the ball 1st and goal with the clock stopped, they should've run the ball, giving Denard one chance to get into the endzone by himself, and then called the timeout. Instead, they allowed Iowa to set their defense and bring in the right personnel. They blitzed the house all four downs so that Michigan had to throw the ball. My other gripe was not calling a screen pass on fourth down. When it became clear that Iowa was bringing everyone, sneaking Vincent Smith out to the flat on the screen seems like the best course of action. Instead, Roundtree got pressed at the line of scrimmage and couldn't create separation. With Iowa bringing the blitz right up the middle on those last four plays, I would have liked to see a little rollout for Denard. The circle route that Mathews ran against ND in '09 and Hemingway ran against Illinois in '10 would have been a great call, especially with Iowa overplaying the slant. Football teams lose to inferior competition every Saturday. The reasons are not always tangible. In fact, usually they are not. Agreed on the circle route, good call. There's a reason Roundtree was a slot in the old offense. Though we don't have many true outside receivers I thought Odoms did a great job on the outside last year and his lack of playing time (in favor of Gallon, Grady, and even Dileo) is mystifying. Borges has been awful against any team that isn't a complete patsy. His resume is more lengthy than impressive and the insistence on running almost everything on the ground with pulling lineman is crippling especially when it makes it nearly impossible for Denard to get outside. I was firmly in the Rodriguez camp and was hoping that he (with a new defensive coordinator) would get another year. But the early returns from this season are undeniable: this is a better coached football team. The onslaught of errors that plagued the Rodriguez regime (special teams, defensive lapses, etc) were symptomatic of a coaching staff that wasn't doing its job. The current staff are better coaches. Whether or not their schemes are better (they're not, IMO) is another matter entirely, but you can succeed with any scheme so long as it's well coached. Tough to make that argument when you account for personnel. I certainly think that Mattison is a far better coach than Robinson, but swap personnel in '10 with '11 and I think you'd see Mattison outperformed. Finally, no way we lose this Iowa game if Rodriguez stuck around. This offense would be averaging a kadzillion points a game. Even if you knock the defense back a peg or two for having a non-Mattison DC, they're still going to be competant enough just based on experience and the fact that a Countess-Woolfolk-Kovacs-Gordon secondary is much better than the 2010 train-wreck. Other than making a few field goals (mostly all very short and none under pressure) have our special teams really improved? The punting has been mediocre or worse, there's no return game despite a bunch of guys on the roster that should be good at returning kicks if nothing else, and our coverage units have also been lackluster. In addition, the only reason you have a post on the page about 2 point conversions was because of a botched extra point. The defensive staff, Hoke included of course, is clearly a major upgrade but as pointed out by Lankownia our secondary not being a complete tire fire is also a significant factor in defensive improvement not to mention the health of Mike Martin and more experience in general. In fact, I think it's safe to say the personnel is better or equal at every spot on D this year except WLB.